WASHINGTON, Feb 5 2014 (IPS) - Global trends towards a strengthening of legal rights over land for local and indigenous communities appear to have slowed significantly in recent years, leading some analysts to warn that the fight for local control over forests has reached an inflection point with a new danger of backtracking on previous progress. The past five years have seen less than 20 percent of global forestland put under community control compared to the previous half-dozen years, according to new research released Wednesday by the Rights and Resources Initiative (RRI), a Washington-based coalition of 140 international organisations. Further, the group says that far fewer legal safeguards were put in place during this latter period, while those laws that have been passed have been weaker. “If private companies and governments from the developed countries don’t weigh in, all of this progress could be lost – this could be it,” Andy White, RRI’s coordinator, told IPS. The slowdown comes despite a significant uptick in the public discussion over land and indigenous rights, with multinational corporations, national courts and Western donors increasingly acknowledging the issue’s importance and pledging to strengthen safeguards for forest tenure. Development workers say this disconnect between words and actions highlights both a lack of prioritisation on land rights and, given the rising rhetoric, an opportunity for future action. “[T]he overriding picture in 2013 remained one of continuing resource grabs by local elites and corporations, aided by governments eager to give away land to investors on almost any terms,” RRI states in its flagship annual report, released Wednesday at a London conference. For now, however, RRI says recent global progress on land rights has been “dismal”. 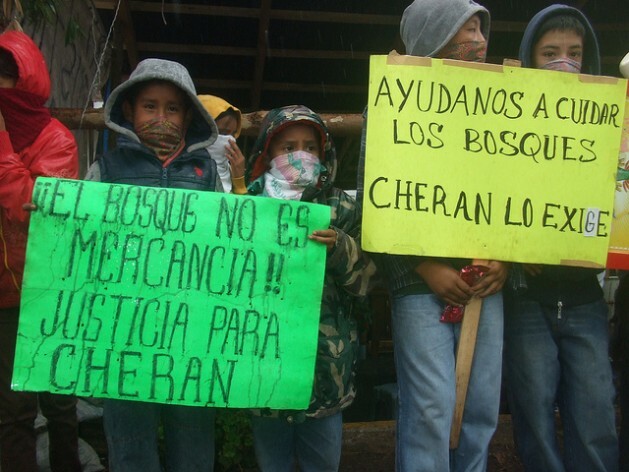 As of last year, indigenous and local communities had some kind of control over around 513 million hectares of forests. Yet particularly in lower- and middle-income countries, governments continue to administer or claim ownership over roughly 60 percent of that land. While this figure has come down by around 10 percent since 2002, these gains are massively skewed towards certain regions and even just a handful of countries. In Latin America, for instance, communities now control around 39 percent of forests, compared to just six percent in sub-Saharan Africa – and less than one percent in the Congo Basin. RRI says that from 2002 to 2013, 24 new legal provisions were put in place to strengthen some form of community control over forests. Yet just six of these have been passed since 2008, and those that have been put in place recently have been relatively weaker, with none considered strong enough to recognise ownership rights. Advocates say recent global trends, coupled with a lack of substantive action from international players, have simply been too much for many developing countries to resist moving aggressively to exploit available natural resources. “It is no coincidence the global slowdown in reform happened at the exact time that the financial value of land, water, and carbon skyrocketed,” Raul Silva Telles do Valle, policy and rights programme coordinator for Instituto Socioambiental, a Brazilian NGO, said Wednesday. In recent years, multinational companies (such as Nestle and Unilever) and multilateral institutions have made a series of important new commitments to honour and strengthen community and indigenous land rights. But these pledges don’t appear to have made much of a difference – at least not yet. Indeed, the new data suggests that one of the most significant multilateral anti-deforestation programmes, the World Bank-run REDD+, has yet to impact significantly on this pattern, despite stated aims. While these commitments have been in line with a rising international understanding on the importance of land tenure to a broad spectrum of development concerns, in 2007 food and land prices suddenly jumped. Analysts say this appears to have cut off a process towards land reforms that had been well underway. “Latin America in 2002 was continuing to go through a series of democratic reforms that included the recognition of indigenous rights as human rights, but the tragedy is that this democratic bolt has not happened in Africa or Southeast Asia,” RRI’s White says. A half-decade later, the new data should worry development and anti-poverty experts. RRI now looks at the current situation surrounding land rights as being at a global tipping point, under strain between the strengthening global understanding of the importance of community tenure on the one hand and the stalled progress on legally and fully enshrining these rights on the other. Yet undertaking the work to secure land tenure isn’t overly expensive, particularly compared to the costs of the violence that has been seen growing around land disputes in recent years. Indeed, this climbing tension could offer a potent point of economic motivation for governments in developing countries to re-prioritise reforms in favour of local control of forestlands. “There’s a clear chance here to increase foreign investment and to strengthen incomes and poverty alleviation,” White says.